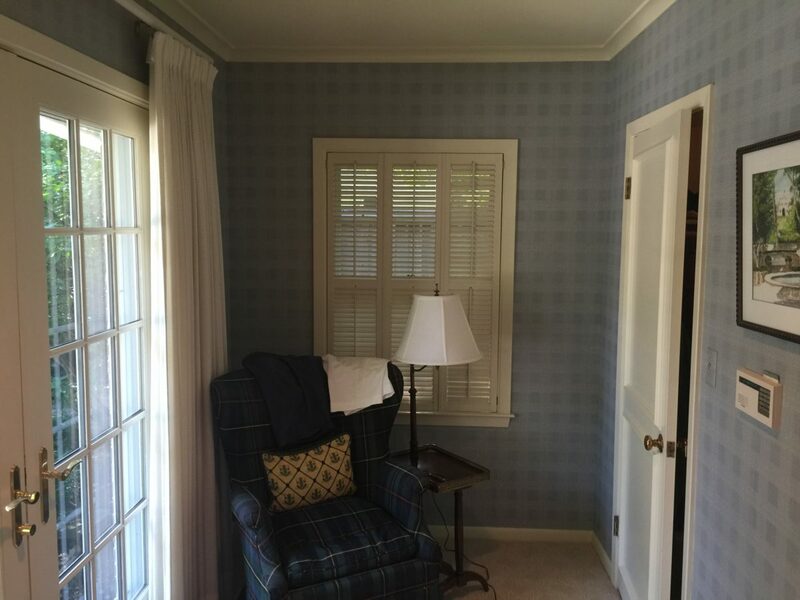 When you’ve been around long enough – that is to say, you’re old, Jim – you get the opportunity to remodel the same house (the same room even!) twice. 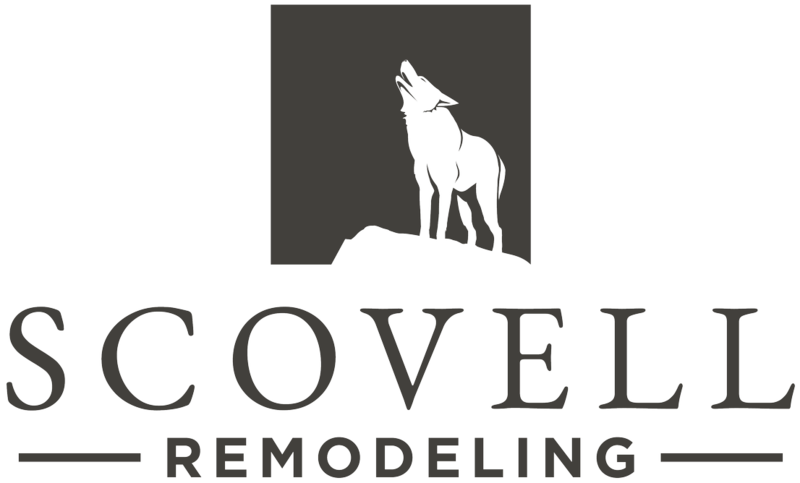 Over twenty years ago Scovell was invited by this Mission Hills couple to remodel their “his” and “hers” master bathrooms. And in 2016 we were invited back again. 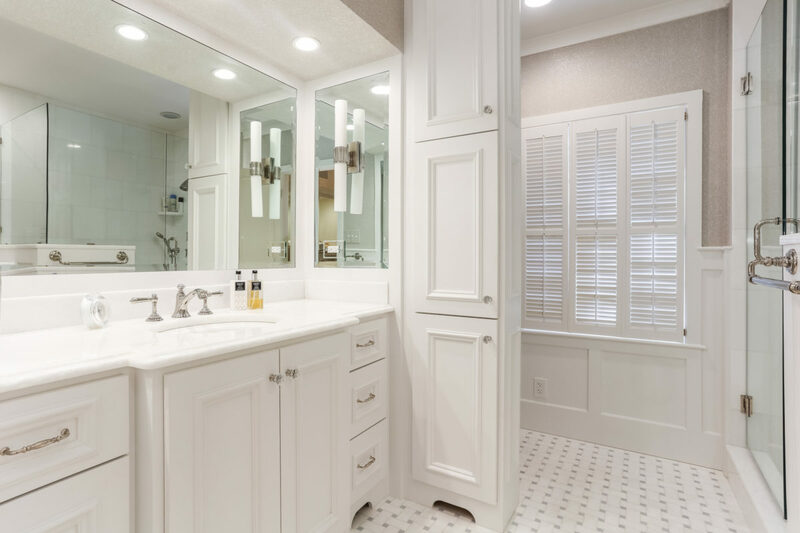 As nice as the husband’s bathroom still was all these years later, functionally, half of it was wasted to a sitting area with wardrobes leading to a backyard door that never, ever got used. Felt silly to not use the space more effectively. So, wisely, a redesign was in order. 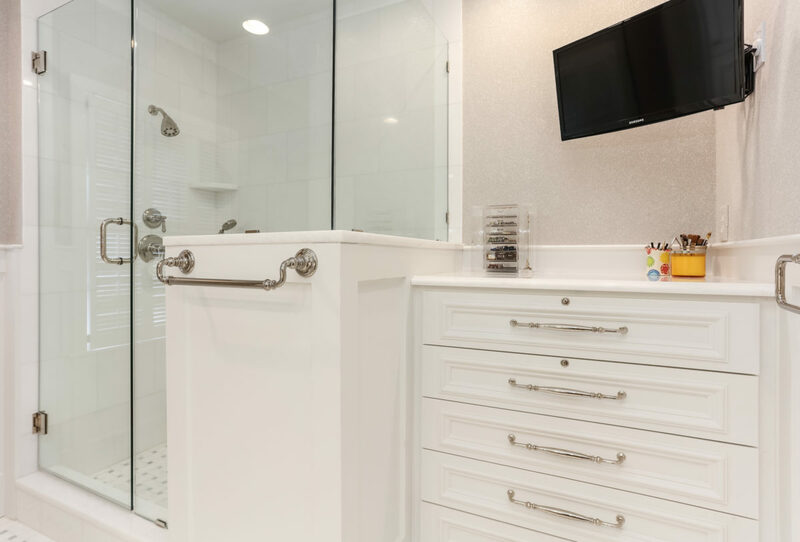 On the other side of the bedroom, the wife still loved the better part of her bathroom, but again, functionally, there was prime square footage wasted – this time on a bathtub that never got used. 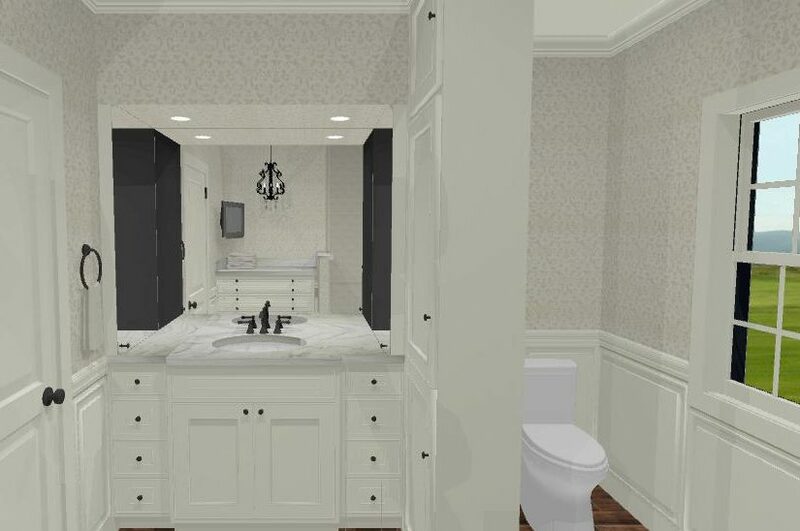 So, while a full redesign wasn’t necessary and she still loved the original cabinetry layout, working with the homeowners’ decorator, we went ahead and started from scratch on all the materials, fixtures, etc. 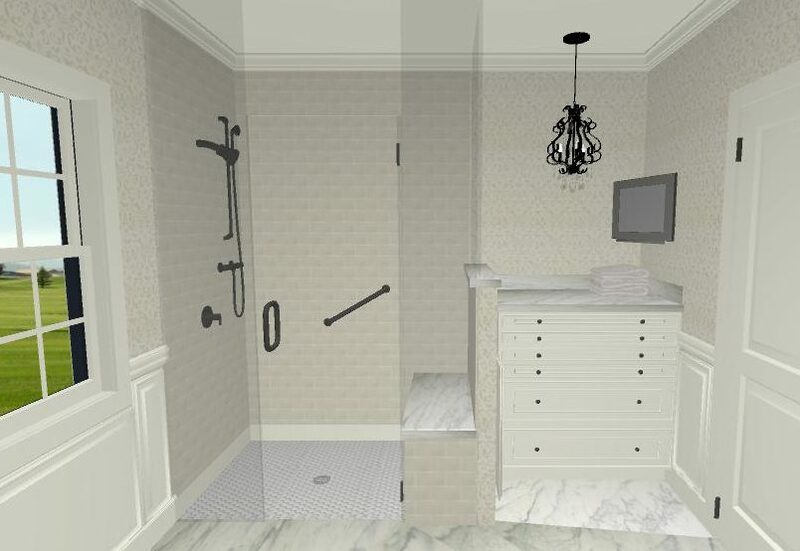 to refine and revise the space just enough to make a tremendous improvement in all the right ways. So, out went the 1996 bathrooms and we tee’d up for 2016. 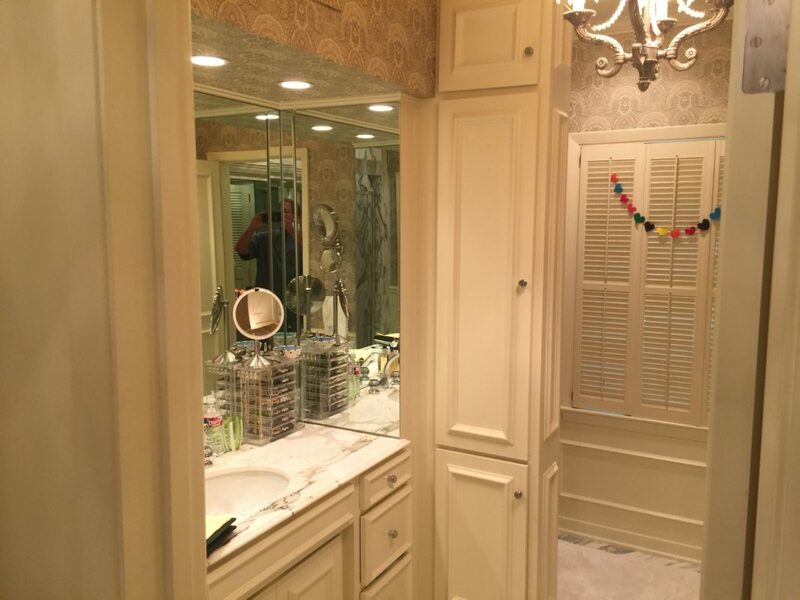 For her bathroom, we rebuilt the vanity wall largely as it was given that she still loved the format. But with lighter and brighter materials and a much improved electrical plan, the difference was huge. 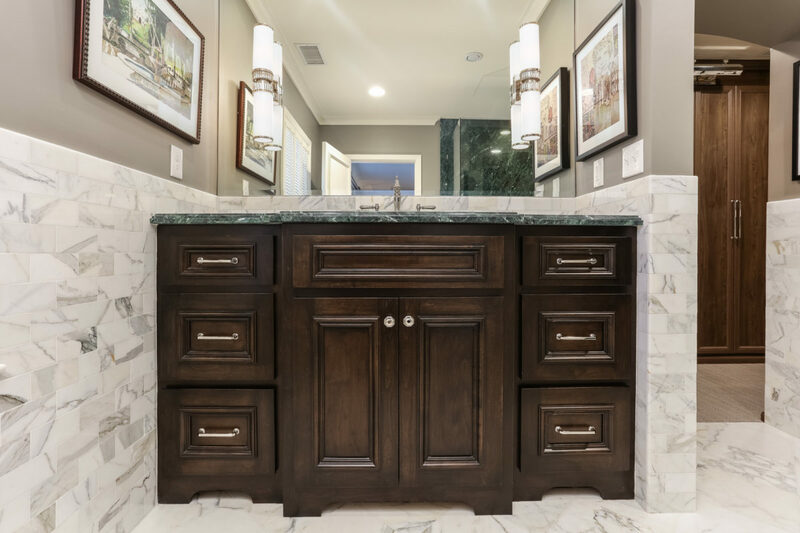 On the opposing wall, after taking out the tub, we enlarged the footprint of the shower and built a custom vanity to its right. 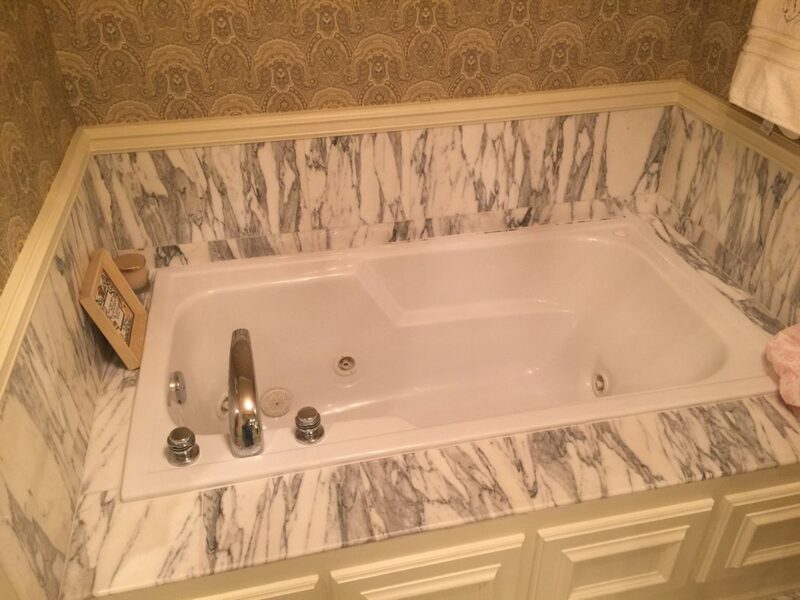 I wish I had a closeup of the marble floor tile that their decorator picked out. White stone with the palest blue inset – totally stunning! 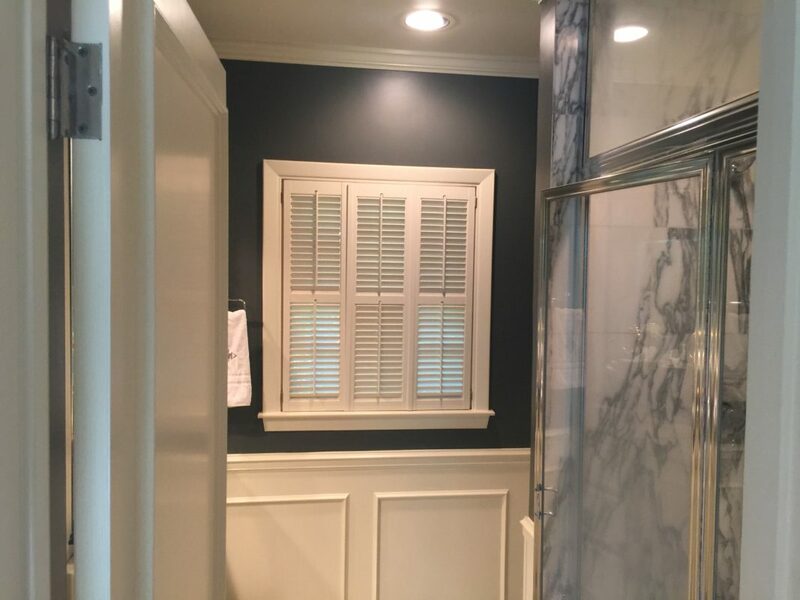 For his bathroom on the other end of the bedroom, we completely overhauled the flooplan, removing the french doors that previously led to the backyard and coming up with a brand new layout. 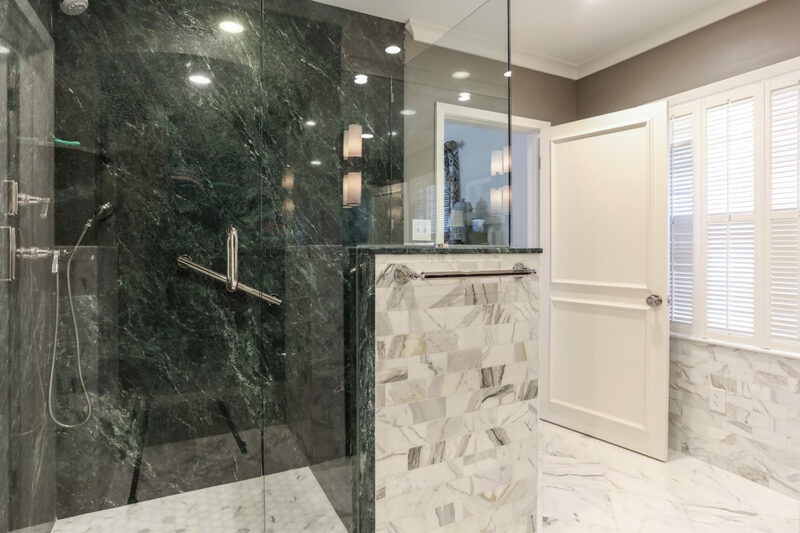 For finishes, the clients’ decorator went much bolder, drawing on a Ralph Lauren aesthetic, with rich stained cabinetry, deep green marble slabs and white marble wainscoting. 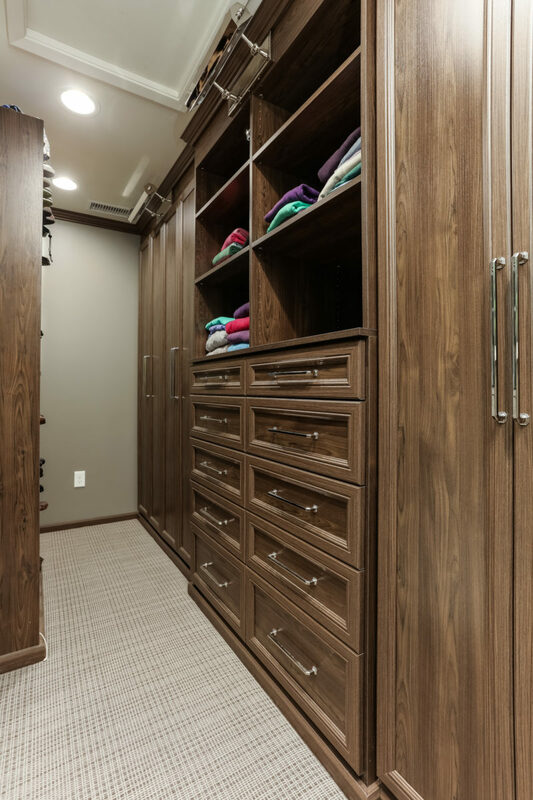 At the end, California Closets stepped in to outfit both his and her spaces. 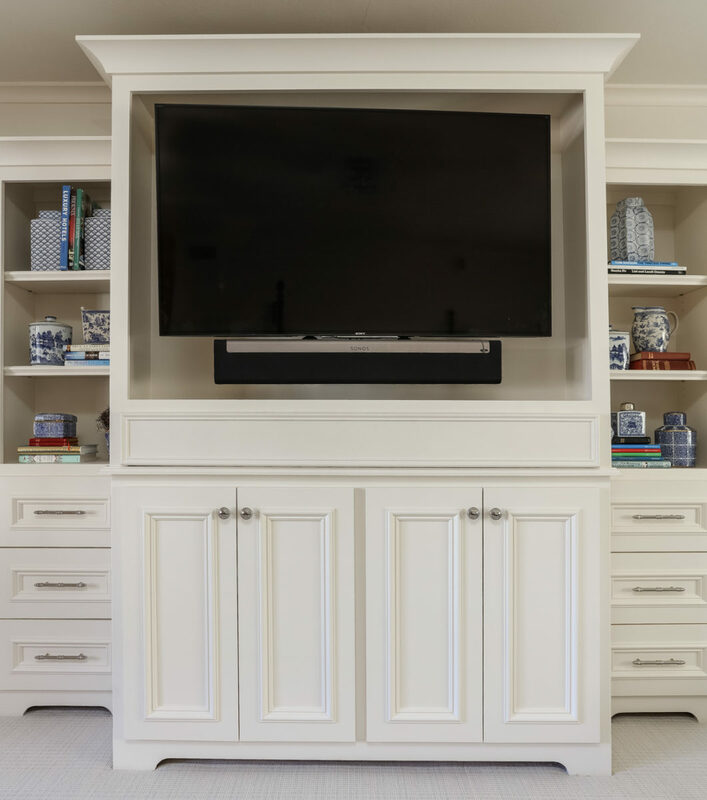 Then, to wrap things up, we added one final touch to the suite – a built-in entertainment center in the bedroom, where previously there was a free-standing piece of furniture. So there you go, twice remodeled and twice as nice!